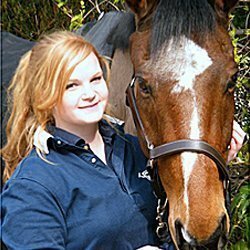 “I have broken my spine twice over the last few years (the first incident being when I was 17) and since then have struggled to do everyday things let alone do anything with my horse. We evented successfully and after my accidents there were a point where I could not see myself ever eventing again with the pain I suffer with. I have been in and out of hospital frequently, having surgery and various horrible treatments to try and break the enduring constant pain. I wasn’t getting any where and my future looked bleak, then I heard of MDIRF.